سنة 1950 (MCML) كانت سنة بسيطة تبدأ يوم الأحد (الرابط يعرض التقويم كاملاً) التقويم الگريگوري، السنة 1950th بعد الميلاد (م)، السنة 950th في الألفية 2، السنة 50th في القرن 20، والسنة 1st في عقد 1950. January 1 – The International Police Association (IPA) – the largest police organization in the world – is formed. January 5 – U.S. Senator Estes Kefauver introduces a resolution calling for an investigation of organized crime in the U.S.
January 5 - In the Sverdlovsk plane crash all 19 of those on board were killed, including almost the entire national ice hockey team (VVS Moscow) of the Soviet Air Force – 11 players, as well as a team doctor and a masseur. January 6 – The UK recognizes the People's Republic of China; the Republic of China severs diplomatic relations with Britain in response. January 7 – A fire consumes Mercy Hospital in Davenport, Iowa, killing 41 patients. January 9 – The Israeli government recognizes the People's Republic of China. January 11 – Hukbalahap guerrillas attack the town of Hermosa, Bataan in the Philippines. January 14: Mount Lamington erupts in New Guinea. The British submarine Truculent collides with a Swedish oil tanker in the Thames Estuary and sinks; 64 die. Cold War: U.S. Secretary of State Dean Acheson delivers his 'Perimeter Speech', outlining the boundary of U.S. security guarantees. January 13 – Finland forms diplomatic relations with the People's Republic of China. January 14 - The first prototype of the MiG-17 makes its maiden flight. January 17 – Great Brink's Robbery: Eleven thieves steal more than $2 million from the Brink's armored car company headquarters in Boston, Massachusetts. January 23 – The Knesset passes a resolution that states Jerusalem is the capital of Israel. January 24 – Cold War: Klaus Fuchs, German émigré and physicist, confesses to an MI5 interrogator that he is a Soviet spy: For seven years, he passed top secret data on U.S. and British nuclear weapons research to the Soviet Union. Fuchs is formally charged on February 2. January 26 – India promulgates its constitution, forming a republic, and Rajendra Prasad is sworn in as its first president. The Kingdom of Mysore is merged into the new republic. January 29 – Lord Balfour criticizes the fact that rationing is still in force in Britain. United States President Harry S. Truman orders the development of the hydrogen bomb, in response to the detonation of the Soviet Union's first atomic bomb in 1949. December – First five-year plan is tabled in the Parliament by Jawaharlal Nehru. It emphasizes Agricultural and Community development. February 1 – Chiang Kai-shek is re-elected as a president of the Republic of China. February 4 – Ingrid Bergman's illegitimate child arouses ire in the U.S.
February 6 – First Cabinet Secretary N.R. Pillai appointed in India. The Stasi is founded in East Germany and acts as a secret police until 1990. Payment first made by Diners Club card, in New York, first use of a charge card. February 9 – Second Red Scare: In his speech to the Republican Women's Club at the McClure Hotel in Wheeling, West Virginia, Senator Joseph McCarthy accuses the United States Department of State of being filled with 205 Communists. Two Viet Minh battalions attack a French base in French Indochina. Pro-communist riots erupt in Paris. The European Broadcasting Union is founded. Albert Einstein warns that nuclear war could lead to mutual destruction. The U.S. Army begins to deploy anti-aircraft cannons to protect nuclear stations and military targets. In an election speech at Edinburgh, Winston Churchill proposes "a parley at the summit" with Soviet leaders, first use of term "summit" for such a meeting. Walt Disney releases his 12th animated film, Cinderella in Hollywood. February 19 – Konrad Adenauer tries unsuccessfully to negotiate with East Germany to begin unification. February 21 – Cunard liner RMS Aquitania arrives at the scrapyard in Faslane at the end of a 36-year career, the longest of any in the 20th Century. February 23 – United Kingdom general election, 1950 : The Labour Party, led by Clement Attlee remains in office but the Tories, led by Winston Churchill increase their seats in the House of Commons. Klaus Fuchs is convicted in London of spying against both Britain and the United States for the Soviet Union, by giving to the latter top secret atomic bomb data. Acting Chinese President Li Tsung-jen ends his term in office. Chiang Kai-shek resumes his duties as Chinese president after moving his government to Taipei, Taiwan. March 3 – Poland indicates its intention to exile all Germans. 8 مارس - الاتحاد السوڤيتي أعلن بأن لديه قنبلة ذرية. March 8 – The first Volkswagen Type 2 (also known as the Microbus) rolls off the assembly line in Wolfsburg, Germany. March 12 – A plane carrying returning rugby fans from Ireland to Wales crashes near Llandow, with the loss of 80 lives. March 13 – Royal Question: Belgian monarchy referendum, 1950 – In Belgium, the referendum over the monarchy shows 57.7% support the return of King Léopold III, 42.3% against. March 14 – The ship Cygnet hits a mine off the Dutch coast. March 17 – University of California, Berkeley researchers announce the creation of element 98, which they name "Californium". March 18 – The Belgian government collapses after the March 12 referendum favouring of the return from exile of King Léopold III. March 20 – The Polish government enacts a law to take possession of properties owned by Roman Catholic churches. March 22 – Egypt demands that Britain remove all its troops in the Suez Canal. March 23 – The 22nd Academy Awards ceremony is held. April 15 – Belgian King Leopold III announces that he is ready to abdicate in favor of his son Baudouin. Apartheid: In South Africa, the Group Areas Act is passed, formally segregating the races. May 1 – UNRWA operations begin. May 5 – Coronation of Bhomibol Adulyadej (Rama IX) of Thailand at The Grand Palace in Bangkok. The town of Cazin (Bosnia) rises up against Communist agrarian reforms. Tollund Man is unearthed in Denmark. Robert Schuman presents his proposal for the creation of a pan-European organisation, which he believes to be indispensable to the maintenance of permanently peaceful relations between the different nations of the continent. This proposal, known as the "Schuman Declaration", is considered to be the beginning of the creation of what is now the European Union. L. Ron Hubbard publishes Dianetics: The Modern Science of Mental Health. May 11 – The Kefauver Committee hearings into U.S. organized crime begin. May 13 – The first race in the inaugural FIA Formula One World Championship is held at Silverstone, England. May 14 – The Huntsville Times runs the headline "Dr. von Braun Says Rocket Flights Possible to Moon." May 17 – Israeli Air Force Spitfires intercept a Royal Air Force Short Sunderland when it inadvertently crossed into Israeli airspace, forcing it to land at Lod Airport. The Sunderland's crew had been issued maps that did not depict Israel, as Britain had not recognized the Jewish State at the time the maps were issued. Celâl Bayar becomes the third president of Turkey. May 24 – United States Maritime Administration (under Department of Commerce). May 25 – The Brooklyn–Battery Tunnel is formally opened to traffic. St. Roch, the first ship to circumnavigate North America, arrives in Halifax, Nova Scotia. 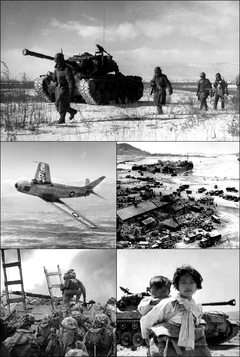 June 25: Korean War begins. June 1 – June 23 – Mauna Loa in Hawaii starts erupting. June 3 – Herzog and Lachenal of the French Annapurna expedition become the first climbers to reach the summit of an 8,000-metre peak. 6 يونيو - سُمِحَ بالأذان في تركيا. June 8 – Sir Thomas Blamey becomes the only Field Marshal in Australian history. June 16 – Maracana Stadium, which becomes a well-known sports venue of Brazil, opens in Rio de Janeiro in advance of the opening of the 1950 FIFA World Cup in the country[بحاجة لمصدر] on June 24. June 25 – Korean War begins: Troops of the North Korean People's Army cross the 38th parallel into South Korea. June 26 – The Parliament of South Africa passes the Suppression of Communism Act. June 27 – Korean War: U.S. President Harry S. Truman orders American military forces to aid in the defense of South Korea. North Korean forces capture Seoul but do not win the war. Hangang Bridge bombing: The South Korean army, in an attempt to defend Seoul, blows up the Hangang Bridge while it is crowded with refugees. Seoul National University Hospital massacre: North Korean troops kill around 800 medical staff and patients. Bodo League massacre begins: South Korean armed forces and police summarily execute at least 100,000 suspected North Korean sympathizers. July 14–21 – Korean War: Battle of Taejon – North Korean forces capture the city held by the U.S. 24th Infantry Division but the delay allows establishment of the Pusan Perimeter. 16 يوليو - اورگواي هزمت البرازيل 2-1 لتحصل على كأس العالم لكرة القدم. July 17 – The Suppression of Communism Act passed on June 26, comes into force in South Africa. July 30 – 4 workers striking over the "Royal Question" in Belgium are shot dead by the Gendarmerie at Grâce-Berleur near Liège. 2 Squadron SAAF departs to take part in the Korean War. 1950 Fairfield-Suisun Boeing B-29 crash – A bomb-laden Boeing B-29 Superfortress crashes into a residential area in California, killing 17 and injuring 68. August 6 – Monarchist demonstrations lead to a riot in Brussels. Florence Chadwick swims across the English Channel in 13 hours, 22 minutes. Winston Churchill supports idea of a pan-European army allied with Canada and the U.S.
Korean War: Bloody Gulch massacre. In his encyclical Humani generis, Pope Pius XII declares evolution to be a serious hypothesis that does not contradict essential Catholic teachings. August 15 – The 8.6 Mw  Assam–Tibet earthquake shakes the region with a maximum Mercalli intensity of XI (Extreme), killing between 1,500–3,300 people. August 17 – Korean War: In the Hill 303 massacre, 39 U.S. soldiers are executed after being captured in battle by North Korea. August 22 – The Immaculate Heart of Mary Seminary is founded in Tagbilaran City, Philippines. August 23 – Legendary singer-actor Paul Robeson, whose passport had recently been revoked because of his alleged Communist affiliations, meets with U.S. officials in an effort to get it reinstated. He is unsuccessful, and it is not reinstated until 1958. Nino Farina becomes the first winner of the FIA Formula One World Championship being the only driver to win the championship in his home country. The comic strip Beetle Bailey is created by Mort Walker. A coal mine collapse in New Cumnock, Scotland, kills 13 miners; 116 are rescued. The game show Truth or Consequences debuts on television. September 8 – The Defense Production Act is enacted into law in the U.S., shaping American military contracting for the next 60 years. September 9 – The U.S. state of California celebrates its centennial anniversary. September 12 – Communist riots erupt in Berlin. September 15 – Korean War – Battle of Inchon: Allied troops commanded by Douglas MacArthur land in Inchon, occupied by North Korea, to begin a U.N. counteroffensive. September 18 – Rede Tupi, the first TV broadcaster from Brazil and South America, is founded. September 19 – West Germany decides to purge communist officials. September 22 – World Dance Council inaugurated. September 26 – Indonesia is admitted to the United Nations. September 30 – NSC 68 is approved by President Truman, setting U.S. foreign policy for the next 20 years. October 2 – The comic strip Peanuts by Charles M. Schulz is first published in seven U.S. newspapers. October 3 – Getúlio Vargas is elected president of Brazil for a 5-year term. October 5 – The Indonesian government quells riots in the Moluccas. Battle of Chamdo: The incorporation of Tibet into the People's Republic of China begins with the Chinese People's Liberation Army invading across the Jinsha River. By October 19 they will have taken the border town of Chamdo and the Tibetan army will have surrendered. The Agate Pass Bridge opens for traffic in Washington State. October 9 – Goyang Geumjeong Cave massacre starts in South Korea. October 11 – The Federal Communications Commission in the United States issues the first license to broadcast television in color, to CBS (RCA will successfully dispute and block the license from taking effect, however). The second Tacoma Narrows Bridge opens in Washington. In East Germany, the Communists win 99.7% of the vote. October 19 – Korean War: The People's Republic of China enters the conflict by sending thousands of soldiers across the Yalu River. October 20 – Australia passes the Communist Party Dissolution Act, which is later struck down by the High Court. October 28 – Torcida Split is founded in support of the Association football club HNK Hajduk Split in SFR Yugoslavia. October 29 – Upon the death of Gustaf V of Sweden, he is succeeded as king by his 68-year-old son Gustaf VI Adolf. October 30 – The Jayuya Uprising is started by Puerto Rican Nationalists against the United States. Pope Pius XII witnesses the "Miracle of the Sun" at the Vatican and defines a new dogma of Roman Catholicism, the Munificentissimus Deus, which says that God took Mary's body into Heaven after her death (the "Assumption of the Blessed Virgin Mary"). Puerto Rican nationalists Griselio Torresola and Oscar Collazo attempt to assassinate U.S. President Harry S. Truman, who is staying at the Blair-Lee House in Washington, D.C. during White House repairs. November 4 – The United Nations ends the diplomatic isolation of Spain. November 8 – Korean War: While in an F-80, United States Air Force Lt. Russell J. Brown intercepts 2 North Korean MiG-15s near the Yalu River and shoots them down in the first jet-to-jet dogfight in history. November 10 – A U.S. Air Force B-50 Superfortress bomber, experiencing an in-flight emergency, jettisons and detonates a Mark 4 nuclear bomb over Quebec, Canada (the device lacked its plutonium core). November 11 – The Mattachine Society is founded in Los Angeles as the first gay-liberation organization. The President of Venezuela, Colonel Carlos Delgado Chalbaud is kidnapped and murdered in Caracas. A Curtiss Reid Flying Services plane crashes while en route to Paris from Rome, killing all 52 on board. November 17 – 15-year-old Tenzin Gyatso is formally enthroned as 14th Dalai Lama, becoming temporal ruler of Tibet. November 18 – The United Nations accepts the formation of the Libyan National Council. November 20 – T. S. Eliot speaks against television in the UK. Anti-British riots erupt in Egypt. Shirley Temple announces her retirement from show business. November 24 – A phenomenal winter storm ravages the northeastern United States, brings 30 to 50 inches of snow, temperatures below zero, and kills 323 people. November 26 – Korean War: Troops from the People's Republic of China launched a massive counterattack against South Korean and United Nations forces at the Ch'ongch'on River and the Chosin Reservoir, dashing any hopes for a quick end to the conflict. Greece and Yugoslavia reform diplomatic relations. November 29 – The National Council of the Churches of Christ in the USA is founded. November 30 – Douglas MacArthur threatens to use nuclear weapons in Korea. December 2 – Korean War: Battle of the Ch'ongch'on River ends with the Chinese People's Volunteer Army expelling UN forces from North Korea. December 31 – The inaugural 12 Hours of Sebring endurance race is held. Canadians Harry Wasylyk, Larry Hansen and Frank Plomp introduce the plastic bin bag for garbage collection. Myxomatosis is introduced into Australia in an attempt to control the escalating rabbit population. IBM Israel begins operating in Tel Aviv. President Harry Truman sends United States military advisers to Vietnam to aid French forces. France institutes a government-guaranteed minimum wage. Knox's Translation of the Vulgate Old Testament (commissioned by the Catholic Church) is published. Laos gets involved in the First Indochina War to overthrow the French Army. 17 مايو – Janez Drnovsek، سياسي سلوڤيني، ورئيس وزراء سلوڤينيا مرتين ورئيس سلوڤينيا الثاني. ^ Kynaston, David (2007). Austerity Britain 1945–51. London: Bloomsbury. p. 385. ISBN 978-0-7475-7985-4. ^ "1950: Government falls as Belgians vote for king". BBC News. March 18, 1950. ^ Witte, Els; Craeybeckx, Jan; Meynen, Alain (2009). Political History of Belgium from 1830 Onwards (New ed.). Brussels: ASP. p. 242. ISBN 978-90-5487-517-8. ^ McGregor, P. M. J. (1978-06-03). "The History of No 2 Squadron, SAAF, in the Korean War". Military History Journal. The South African Military History Society. 4 (3). ISSN 0026-4016. Archived from the original on 2009-07-22. Retrieved 2009-07-18. ^ Pelletier, Joseph (1983). The Sun Danced at Fatima. New York: Doubleday. pp. 150, 151. ^ Rahul, Ram (2000). March of Central Asia. Indus Publishing.